A very good Bond movie with terrific scenery, an interesting plot, and some cool action. Skyfall is a very entertaining film. The action is once again superb, and Daniel Craig is terrific in the role as always. The story here is pretty interesting too, giving us a mystery in the first half that slowly leads to us meeting the villain. The second half is all about the villain. The entire movie is loaded with incredible visuals (the Shanghai scenes in particular, really stand out), and while there are certainly some problems, including not showing us the villains uescape, and a lousy end to the climax, the movie is overwhelmingly pretty cool. The action is really shot well. Between that and the story, as well as all of the atmosphere, this turns out to be a pretty great movie. The movie gets things started with great intensity right from the beginning. It opens with a car chase sequence that ravishes the streets of Istanbul, turkey, before it turns into a rooftop motorcycle chase. Soon after that it becomes a brawl on top of a train. Bond operates a crane, tearing train cars apart, and fist fighting with the villain as the train zips through a tunnel. When our characters have to dive down to fit into the tunnel, it reminds us of the very first Mission Impossible film. When we watch the motorcycles fly through the air onto rooftops, it reminds us of the Bourne movies. At this point, we’ve seen it all before, but it’s still a lot of fun. Especially when shot so vibrantly, with everything looking great (no CGI effects here, this stuff was really done.) And it ends with bond being accidentally shot by his own people and plummeting into the water below. What an opening! There’s a cool title sequence and song by Adele, and when we resume the storyline, Bond is dead. Not really, but everyone thinks so. He’s actually in a foreign country slowly recovering. He drinks with the locals at a bar and entertains them by drinking from a glass with a live scorpion walking around in it. Back in London, meanwhile, an unknown villain steals all of Ms files that tell of secret agents who are undercover out in the field. Then this villain blows up MI6 headquarters. It’s time for Bond to come home. This movie shows us Bond in such bad shape that he tries his hand at a firing target practice and ends up way off. We’ve never really seen him like this before, and he takes the tests, but doesn’t seem to be doing very well with them. There’s a great moment where a tester asks him about Skyfall, and we don’t learn what it is, but certainly have our curiosity awakened. Bond passes the tests by the smallest of margins, and they throw him back into the field. First up is meeting his quartermaster, Q. This guy is so young that he looks and acts like he’s right out of college. He also has some fun takes on the way they do things in the spy world today. Q tells bond that he can cause more damage from his laptop in a day then Bond can do in the field in a year (or something like that.) He also has a quip or two about the old gadgets that they used to give agents, like exploding pens. And then he sends Bond off to Shanghai, China. The China scenes are fantastic. They look absolutely amazing. The director of photography on this movie is Roger Deakins, the Oscar winner who often collaborates with the Coen Brothers on their best-looking films. You can tell that he had a lot to do with why these China scenes look so amazing. There’s one that involves the inside of a building where all of the walls are see-through. Giant lit up LED displays from outside billboards, flash on all of the walls. Then there’s another scene that involves a boat ride through red dragon structures under a fireworks display at night, and still another that takes bond down into a Komodo dragon pit for a fight. This is cool stuff, and it all looks fantastic. It takes a while for us to meet the villain, (over an hour), but we finally do after Bond takes a ship ride to an island that now holds the deserted ruins of what was once a great city. 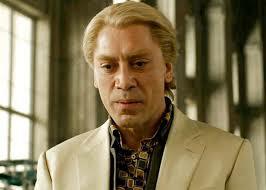 The villain is Silva, played by Javier Bardem, and he’s not as great as I would have expected. Bardem was masterful in his villain role for the movie No Country For Old Men, and even won a well-deserved Oscar for it. Here, he is not as great, with a few too many smiles and speeches that make him seem like he’s having fun and just playing a game. He’s got bleached blonde hair and an attitude that doesn’t allow him to feel truly menacing. Still, his character has got some great scenes, like one where he does target practice off a girl’s head, and another where he sets up a train escape through an underground tunnel. The Silva character does get one truly great moment where he takes out his teeth to reveal his real deformity. This is the scariest and creepiest moment in the movie. But then there’s also plenty that doesn’t work about the character, starting with how long it takes us to meet him, and ending with how anti-climactic things become by the end. Another problem is that a lot of Silva’s story feels like we’ve seen it before. The MI6 team catches Silva, he escapes, and we get to hear about how he planned to get captured and wanted them to get him and take him into their headquarters. Wasn’t this already done in each of the last two Christopher Nolan Batman movies, first with The Joker in prison, and then with Bane on the plane in the opening sequence of the third film? Still another problem with Silva or with the movie and what they show us of him, is that we don’t even get to see his escape from an MI6 holding cell. We get to see him setting up for it, and hear a guard commenting on what he’s doing, and then the next thing you know, all the guards are down on the floor and Silva is nowhere to be found. These problems aren’t major, but they are enough to make us wish for more. And then it’s onto the final act that takes us into Scotland, where we learn about Bonds past. We see his old home, meet the old groundskeeper, and even get to see Bonds original Aston Martin car as it gets put to work. This old deserted mansion sequence is fantastic. Albert Finney (a Bourne alumni) leads us through the house and I love how our three characters (Bond, Finney, and M,) get to set up the place knowing the villains are coming to get them. It leads to a fantastic and explosive climax that really punctuates the film. It’s only the final moments with the main villain that are lacking. Otherwise, the climax is pretty great. 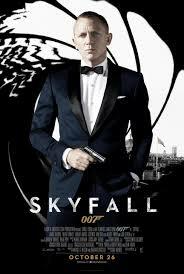 Skyfall is a very cool movie. The look of the film is fantastic. What the movie has to say about the spy world, and how it has changed, is incredibly interesting. M’s career is challenged over and over again in this movie by her higher ups, and she is even put through a hearing about the relevance of the MI6 organization. There are quips about old spy inventions and we get to see the old Aston Martin in action. There’s talk of Bond’s childhood. And most important, there are plenty of great action sequences. When Bond gets into (or really under) an elevator, for a ride up through that see-through building in Shanghai, for example, it is just amazing. This movie has a lot going on, and once again a Daniel Craig Bond movie absolutely delivers. The series is two for four (with Casino Royale and Skyfall being the high points,) but those two movies are so good that they are quite possibly the best Bond films of all time.